John Dennehy looks at the impact of one man on Irish life during World War One. Such reports were not likely to engender hopes of a swift war or encourage anyone into joining the army. But for the authorities, and their attempts to secure more recruits in Tipperary, one man provided the ideal antidote to such press. James Somers was born in Belturbet, County Cavan, but with his family had come to live in Cloughjordan some years before the war. He enlisted in the Inniskilling Fusiliers in 1912 and was posted to France as part of the British Expeditionary Force at the outbreak of war. Sgt Somers was injured during the retreat from Mons and spent Christmas 1914 at home in Tipperary. When the news filtered through to Tipperary, the local council at Borrisokane passed a resolution congratulating their ‘hero’ Sergeant James Somers.5 Back at Cloughjordan railway station a few days later Somers was greeted by the lord lieutenant for Tipperary Lord Dunalley (a prominent member of the local gentry), recruiting sergeants, the Irish National Volunteer Brass Band, a number of military officers and other low-level officials. Somers did not say much at the reception apart from stating he had just done his duty and also paying tribute to Irish regiments in the field. But after receiving his VC from King George V about a week later Somers actively participated in the recruiting campaigns in Northern Ireland. On 18 October he visited a police court and a football game at Grosvenor Park between Glentoran and Distillery to call for recruits. He told the crowd: ‘That’s the place for you boys [the recruiting office], and then the battlefield and if you have to die on the field of honour you will die a glorious death for your country, for freedom and liberty.’ The following day at a Belfast Rotary Club meeting Somers said he had come straight from London to Belfast to help with the recruiting campaign but regretted his appeals had not met with much success. It is unclear why Somers did not speak out on recruiting in Tipperary when so many other soldiers had been doing just that. And especially so considering his appeals in the north. But what was undoubtedly clear in 1915 was the authorities’ desire to exploit his VC win to benefit recruiting. The tradition of military service was strong in the county. And this was bolstered by the presence of so many garrisons, anchored by the Royal Irish Regiment depot at Clonmel. This gave the army a high-profile with troop marches, parades, and even military funerals representing a pomp and glamour that was an attractive alternative to the mundane drudgery of provincial life. There is no evidence, however, to suggest any spike in enlistments due to Somers. But undoubtedly some saw the military as a way to escape from their current situations and to witness a local man like James Somers feted by people in positions of power would not have damaged recruiting efforts. John Dennehy is a freelance historian and journalist working out of Dublin. In 2010, he completed a doctorate on Ireland and the First World War at University College Cork. 1 Philip Orr, Field of Bones. An Irish Division at Gallipoli (Dublin, 2006), 183. These were usually officers, privates just merited name and rank. 2 Nationalist, 11 Sept. 1915. 3 Ibid. 24 Nov. 1915. The piece also carries a list of Clonmel men who were at Suvla Bay. 4Nationalist, 28 Aug. and 1 Sept. 1915. Somers’s brother Albert had joined the Royal Irish Cadet Corps during the Jorgensen campaign in early 1915. Somers was by that stage a sergeant. 5 Ibid. 1 Sept. 1915. 6 Irish Times, 30 Aug. 1915. 7 This had no effect, see a confidential report on recruiting, Nats 1/249 and Nationalist, 28 Aug. 1915. 8 Irish Times, 30 Aug. 1915. 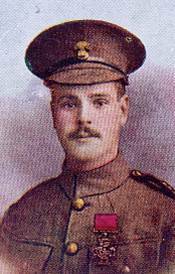 The paper reported Sergeant Somers (then a private) was badly wounded at Mons and only returned to active service to be sent to the Dardanelles. 9 Nenagh Guardian, 9 Oct. 1915. 11Ibid. and Nenagh Guardian, 9 Oct. 1915. 12 Nenagh Guardian, 9 Oct. 1915. 14 Nationalist, 3 Sept. 1915. The same edition also gives an account of Oscar Hennessey, King’s Liverpool Regiment, who was recommended for the DCM. This piece on Somers is about half a broadsheet page. Written by: John Dennehy on 15 May, 2011. Last revised by: John_Dorney10 September, 2011.